Dressed in long pants, long-sleeve shirts and closed-toed shoes, a team of researchers from Colorado Parks and Wildlife gathered in a sagebrush-grass meadow near Gunnison, Colo. this summer, each with a GPS in hand. Lining up 10 meters apart along the border of a virtual grid, they walked straight lines over a Gunnison’s prairie dog colony and dropped quarter-sized peanut butter cubes behind them. It was one of three Gunnisons colonies where the delectable cubes became just a treat for any animal that found them, but at another three, the cubes contained a vaccine against sylvatic plague, which has ravaged the West’s prairie dog populations. While the Gunnison's prairie dog was declined an Endangered Species Act listing this fall, plague is one of the big concerns in the way of the species' continued success. This was the first year of a larger three-year study of the real-world effectiveness of the new Sylvatic Plague Vaccine (SPV), now being conducted by the U.S. Geological Survey and local partners across seven Western states. In the lab setting, the vaccine has effectively protected 90 percent of animals tested, and tests show that it lasts for at least nine months once ingested. Now it’s time to find out whether SVP works in the wild. When plague was first introduced to the U.S. in the early 1900s, likely by rats that traveled on ships from Asia, it caused a human outbreak of disease and death in San Francisco. From there, the disease moved east, stopping mysteriously near the 100th meridian. In 2008, it started moving east again, showing up in South Dakota for the first time. Not many people have caught it -- the Centers for Disease Control reports an average of seven cases of human plague each year across the nation. 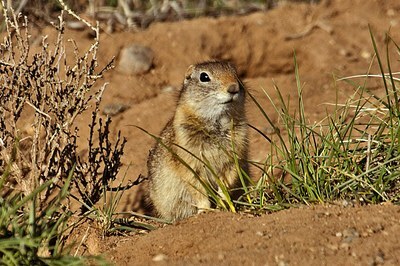 But the disease has become one of the major reasons for the decline of all four of the country’s prairie dog species, including the federally protected Utah prairie dog and the Gunnison’s prairie dog, which was a candidate for federal protection until this fall. Prairie dogs have very low immunity to plague, and an outbreak can wipe out a colony. And even when there are no outbreaks happening, plague can exist at low levels in a population, causing a slower die-off. Sylvatic plague also hits black-footed ferrets from two angles. Ferrets are susceptible to the plague bacteria too, but more importantly, when plague kills off a prairie dog colony, any ferrets living nearby lose their main food source. Plague has been one of the main obstacles to a successful recovery to the struggling ferrets, which were thought to be extinct twice in the past century. While SVP doesn’t work to protect ferrets against plague directly, by treating prairie dogs, researchers at the U.S. Geological Survey say the work could help the ferrets reestablish as well. For several years, the USGS has been fine-tuning the vaccine in the lab. Since the 1990s, wildlife managers have used an oral vaccine for controlling rabies in carnivores like fox and coyote, and in raccoons, and seen great success. Using that model and a very similar virus, researchers developed the new SVP. To make sure the prairie dogs would actually eat the vaccine pellets, Rocke’s lab tested several bait flavors like blueberry and sweet potato, and eventually settled on peanut butter. “Rodents love it,” Rocke says. Plague is carried and transmitted by fleas. Once it takes hold in a prairie dog colony, it can spread quickly and be devastating. And having an effective tool to treat entire colonies of prairie dogs is exactly what scientists say is necessary to keeping those communities and their surrounding ecosystems healthy. Burrowing owls use the dogs’ burrows for shelter, and raptors and swift foxes hunt the dogs for food. The endangered black-footed ferret relies almost exclusively on the prairie dog for food and, like the burrowing owl, use the dogs’ tunnels for their own homes. Dan Tripp, wildlife disease researcher for CPW, says that in addition to caring about plague control for ecosystem health, having tools to prevent plague outbreaks will be good for the state’s agriculture and development sectors too. By establishing healthier, more stable prairie dog colonies in conservation areas, states could avoid an Endangered Species Act listing for the three prairie dog species not on the list; which would help out ranchers, since listings can tie ranchers' hands with land use restrictions. “Our goal isn’t necessarily to make more prairie dogs, but to stabilize populations,” he says. State and federal agencies have tried other methods to control plague outbreaks in the past, but none have been all that successful. To protect black-footed ferrets, biologists have vaccinated them before releasing them into the wild. This approach seems to be effective in protecting individuals from disease, but any offspring they produce are susceptible, and if the prairie dog colonies they rely on get infected, the ferrets will be without food. Other efforts have involved using an insecticide dust on colonies showing outbreaks. The dust kills fleas that transmit the disease, but it can also harm non-target insects in the area. Controlling diseases in humans and domestic animals is hard enough, says Miller: “All those challenges are still there for wildlife, and then they are multiplied by several orders of magnitude.” Often wild populations are harder to reach because of geography and our limited knowledge of population size and location. In many diseases, we don’t even have the tools to treat the pathogen, he says. If the studies in the coming years show that this vaccine is successful in protecting prairie dogs from plague, it could be a game changer for the dogs’ conservation as well as for ferret reintroduction. It’s too early to be truly optimistic; at least two more years of field studies are needed for conclusive data about how effective the vaccine is. But there’s room for hope. “There are very few cases in the world where people trying to control disease in wildlife have been able to do so,” says Miller. “The only good example in the U.S., or really in North America right now, is rabies vaccination.” This plague vaccine, he says, might be our second. Katie Mast is an editorial intern at High Country News. Gunnison's prairie dog image courtesy USFWS. Flea image courtesy USGS.